An ecologist and PhD physicist, Mario Petrucci implements creative dialogue between science and poetry, is co-founder of the experimental collaborative 'co-vocal' poetry group ShadoWork and the modernist pamphlet press Perdika, and has launched several novel concepts in criticism, including Spatial Form and Poeclectics. First (and only) resident poet at the Imperial War Museum and BBC Radio 3, Petrucci is active in site-specific and cross-media projects. Fearnought (Poems for Southwell Workhouse) commingles photography with poetry, and became the subject of a Radio 4 Sunday Feature. Heavy Water: a film for Chernobyl and Half Life: a Journey to Chernobyl, sibling films based on his Arvon/ Daily Telegraph-winning poetry, gained the Cinequest award and a major showing at Tate Modern in 2007. 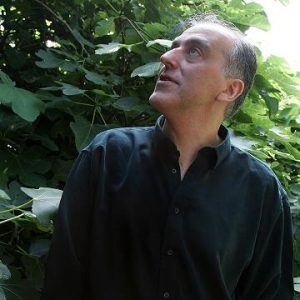 In recent years, more deeply influenced by the Projectivist poetics of Charles Olson, Petrucci has completed a 1111-strong sequence entitled i tulips, from which somewhere is january is an early selection. Tuned tight as piano wire around their line breaks, these are 'macro-breath' poems - though the single breath they evoke in the mind may demand more than one breath from the lungs. 'Tales from the Bridge' was a major installation of poetry on the River Thames, written by Mario Petrucci and shortlisted for the 2012 Ted Hughes Award. A centrepiece of the 2012 Olympic festivities, it was the world's largest 3D poetry soundscape. In 2016, Mario’s much-awaited versions of Montale's masterwork, Xenia, were published in English by Arc, capturing the PEN Translates award . In the same year, his 'comet poem' Philae was featured by the European Space Agency (see Recordings). 2018 saw the publication, with Bloodaxe, of his remarkable translations of the great Persian mystic poet, Hafez. From Mario’s translations of Hafez: excerpt from ‘Beloved 81’, recorded by the author in 2017. Philae was the robot probe that landed on comet 67P/C–G (12th November 2014). This recording (made in 2015 by the author himself) is featured on the European Space Agency website. This recording was made by Penelope Woods on 3 July 2009 at the Sound Archive at the British Library. ShadoWork is a collaborative writing and performance-training initiative co-founded by Mario, concerned with dynamic multi-vocal performances of poetry and the literary exploration of multimedia. The ShadoWork poets are: Mario Petrucci, Sarah Dudman, Martyn Crucefix, Brett Van Toen. Shrapnel and Sheets (Headland, 1996) ISBN 0-903074-92-3. Bosco (Hearing Eye: pamphlet 1999; book 2001) ISBN 1-870841-64-6 & ISBN 1-870841-77-8. Lepidoptera (Kite Modern Poetry Series, 88 & 96; 1999, 2001) ISBN 0-907759-47-5 & ISBN 0-907759-87-4. The Stamina of Sheep (the Havering Poems) (The London Borough of Havering/ Bound Spiral Press, 2002) ISBN 0-9539939-1-4. Heavy Water: a poem for Chernobyl (Enitharmon Press, 2004) ISBN 1-900564-34-3. Half Life (Poems for Chernobyl) (Heaventree Press, 2004) ISBN 0-9545317-3-6. Catullus (Perdika Press, 2006) ISBN 1-905649-00-2 (2nd printing 2007, ISBN 978-1-905649-00-6). Fearnought (Poems for Southwell Workhouse) (The National Trust, 2006) ISBN 978-1-84359-251-8. Flowers of Sulphur (Enitharmon Press, 2007) ISBN 978-1-904634-37-9.
somewhere is january (Perdika Press, 2007/8) ISBN 978-1-905649-06-8. Sappho (Perdika Press, 2008) ISBN 978-1-905649-09-9.
i tulips (Enitharmon Press, 2010) ISBN 978-1-904634-93-5. Nights * Sifnos * Hands (Flarestack Poets, 2010) ISBN: 978-1-906480-24-0.
the waltz in my blood (Waterloo Press, 2011) ISBN: 978-1-906742-40-9.
anima (Nine Arches Press, 2013) ISBN: 978-0-9573847-3-6. 1111 (Perdika, 1 April 2014) ISBN: 978-1-905649-18-1. Heavy Water: a film for Chernobyl (with Phil Grabsky and David Bickerstaff) Seventh Art Productions, 2006. Half Life: a journey to Chernobyl (with Phil Grabsky and David Bickerstaff) Seventh Art Productions, 2006.